Sorry for the delayed posts. I had most of this ready for print last week. But things had not completely resolved enough to hit the publish button. Instead, I chose to work in the studio. It’s that old pit bull behavior: I couldn’t let go until I was really satisfied. I met a fellow sewist a few weeks ago. Over dinner, I mentioned that my blog is about the creative process and that specifically this post is about iterations. She was very affirming and reminded me that ALL products evolve. No versions one, two or three are perfect. We, the general public, don’t get to see the transformation of a product. 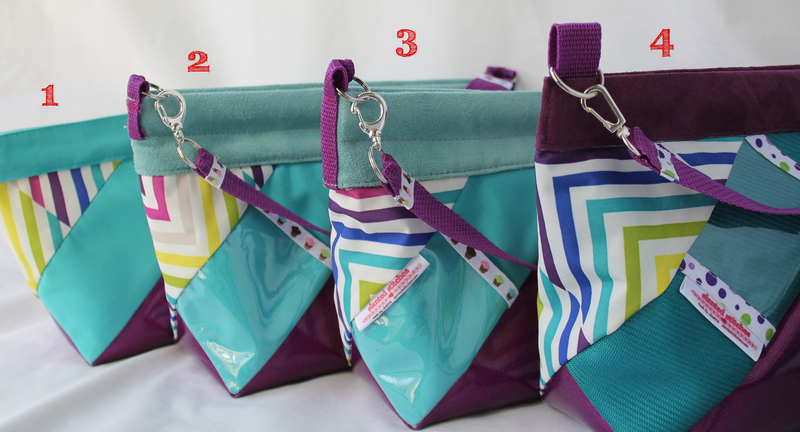 So here’s a behind-the-scenes look at the development of my newest Sock size and Tote size bags. After publishing Road Testing Bags post, I am realizing that blogging is having some interesting side benefits. I can gain some emotional distance. 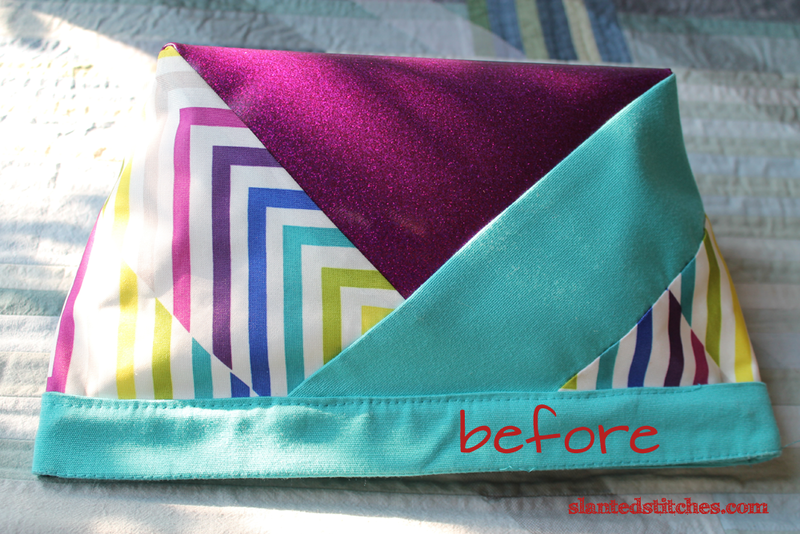 I didn’t recognize a flaw in the ‘After’ design until seeing it on the blog. The strap handle attachment looks amateur. Last week I created version 3. Satisfying…I really like the aesthetics now. A few more issues to resolve with the construction process can be dealt with once I’m in production mode. It was a very labor intensive process and still too bulky. While ripping version 3 a part, I came up with a much simpler, easier, ‘duh, moment’ solution. So we now have version 4. And I’m thinking of changing the lining to both speed production and add a pocket. Version 5 will be tested in the next color. You can see the succession or iterations. Original thinking…This should be easy, simpler construction, nicer fabrics…wrong. This has been the frustration project. Is it a coincidence that the two current projects have same issues with the strap connection to the bag body? Form: Does it (fabric chose, strap, pockets, etc) match the aesthetic of the bag? Process: how much time, broken needles, sore neck and fingers are required to do this? In other words, am I going to LIKE making 4-5 of these at a time? Function: a collection of old handbags, window shopping and road testing narrowed the style of handles to a rolled version. I found out it’s called ‘rouleaux.’ It’s comfortable in the hand and on my shoulder. Form: The body is a medium weight tapestry. 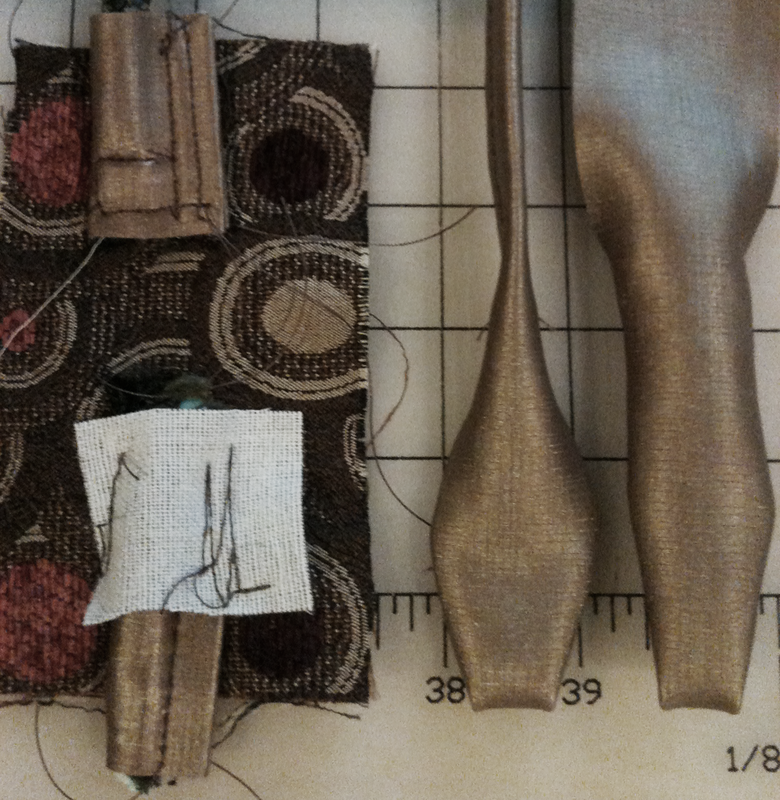 It’s too thick and textured for the handle, so a contrasting fabric is needed. I found a nice faux leather that works beautifully with the body. but all the faux leather handles on my sample bags have a finished edge. a. How do you attach a rouleaux handle? Where on the bag? Hardware? (Maybe the next version) A tab? as simple as possible. Searching the Internet helped a bit. c. A bad habit bit me bad. I took a chance to try the simplest tab, (flare the ends of the handle to form the tab). It wasn’t simple. It had a weak point at the end of the cording. It was floppy and could easily tear after some use. Lesson learned: You need good leather not vinyl to accomplish this simple look. Unlike yarn (where I picked up that bad habit of not swatching and jumping right in), I can not unravel this handle. I just wasted good faux leather. d. Ok, hand sufficiently slapped…I decided it would be better to make swatches of the attachment. This version, modified Morin’s tab covered attachment. * I am not a Craftsy affiliate. 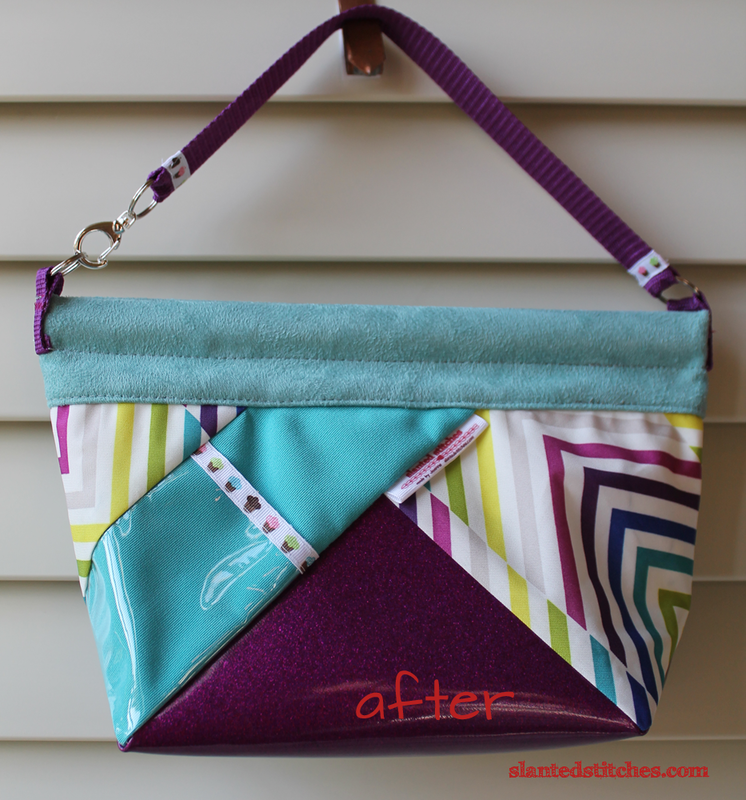 This entry was posted in Etsy Shop: Slanted Stitches, Sewing and tagged craftsy, fabric, knitting, making, Modifications, process, purse design, sewing on October 28, 2014 by slantedstitches. What do you do at 75 miles per hour sitting in the passenger seat for 6-10 hours a day? I was prepared to listen to podcasts (TED talks Radio Hour, Freakonomics, America’s Test Kitchen Radio, The Splendid Table, Grammar Girl, Daily Audio Bible, Merriam-Webster Word of the Day plus a few knitting podcasts). Surprises! My first driving partner loved audible books but didn’t know about podcasts. She’s hooked now. I was prepared to complete a few knitting projects, more about these in a separate blog post, Full Circle (Finished Objects). Basically, I took projects that I thought were going to be simple easy. I was wrong. There was no stopping for picture-taking. So I learned to take drive-by photos. What’s interesting at 75 miles per hour? I did discover a connecting theme for picture-taking at the very beginning. If you are looking for something interesting, you’ll find it. The only other repeating theme: road construction. Who wants to see that?!? I missed a lot of great scenes, especially on the first trip. I did get better by the last trip. (HINT: have the camera ready to click as you approach a bridge or overpass and just keep clicking.) None are ready for National Geographic (check out NatGeo on instagram). 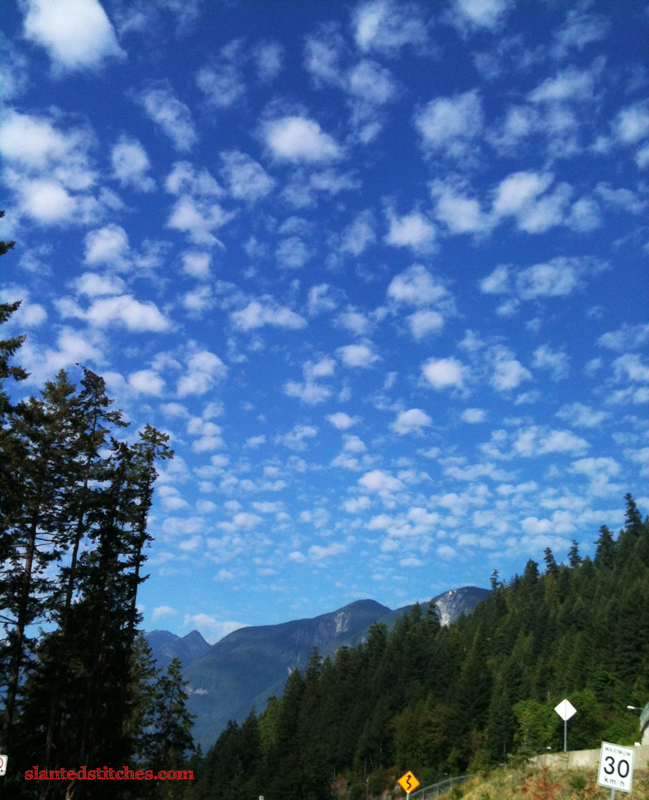 Shamefully, there are no pull-off vista points along the freeway from Vancouver to Whistler, B.C. I would say that is the only mistake the Canadians made in connecting the site of the 2010 Winter Olympics with the rest of the world. But by mistaking what the GPS said, we veered off-course and headed to the ferry terminals at Horseshoe Bay. It did provide us with a great photographic opportunity of the water and Bowen, Gambier and Bowyer Islands…deep blue sky and the clouds. Don’t ask me the names of the cloud formations. I haven’t got a clue. I just love seeing them. Part of the fascination…it’s constantly changing…It’s so big…Are we so busy with our lives to be looking up and staring at the sky? Is anyone else seeing what I’m seeing? Are these the same clouds we saw two days ago? Can a photograph capture any of this grandeur? I hope when I get home, I will look up more often. At the time we drove from Tennessee to Pittsburgh and back, not much interesting was happening in the skies. Texas skies are dramatic. 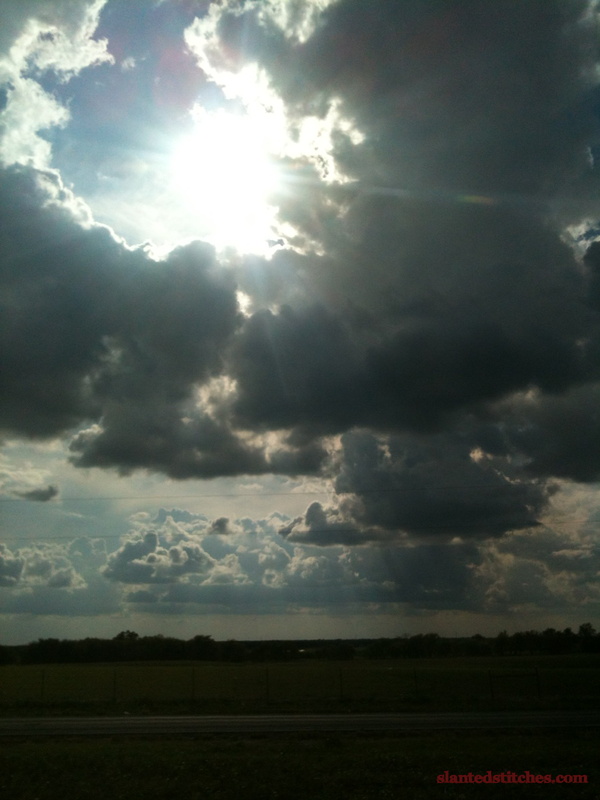 It’s where I get to see “God clouds.” You know what I mean… when you see the sun rays breaking through the clouds. Think Noah’s Arc or the opening scene of The Simpsons. The one benefit of a very flat landscape is seeing forever or more realistically 30-50 miles to the horizon. Click on the picture to see the sun rays. Tampa skies, where there was always a higher overcast layer of clouds. Not the dramatic contrasts of the Texas sky. But it’s definitely fun to watch several distant storms rolling by. 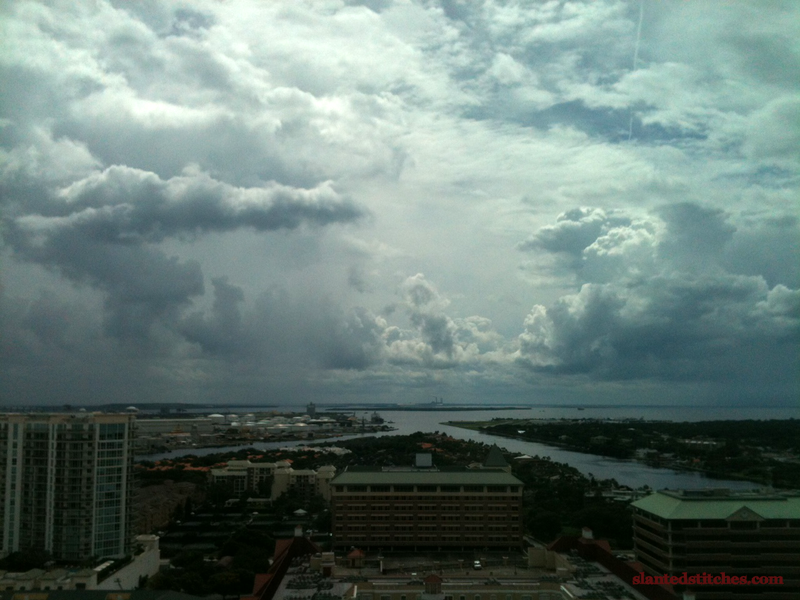 You can see at least two rain showers dropping over St. Petersburg across the bay. This picture was taken through our hotel window. Not too bad considering these shots were taken with an old iphone 3. And if you haven’t had enough of clouds, here’s a time-lapse video of a storm over Nebraska. I have to include one last shot. 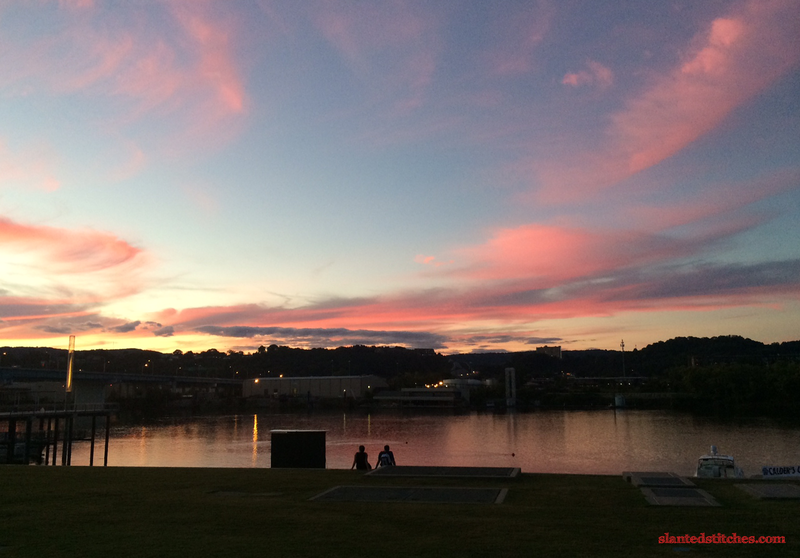 It was near the end of our trip, sunset overlooking the Tennessee River in Chattanooga on their Riverwalk. Even though we still had miles to go, this was a wonderful rest stop. 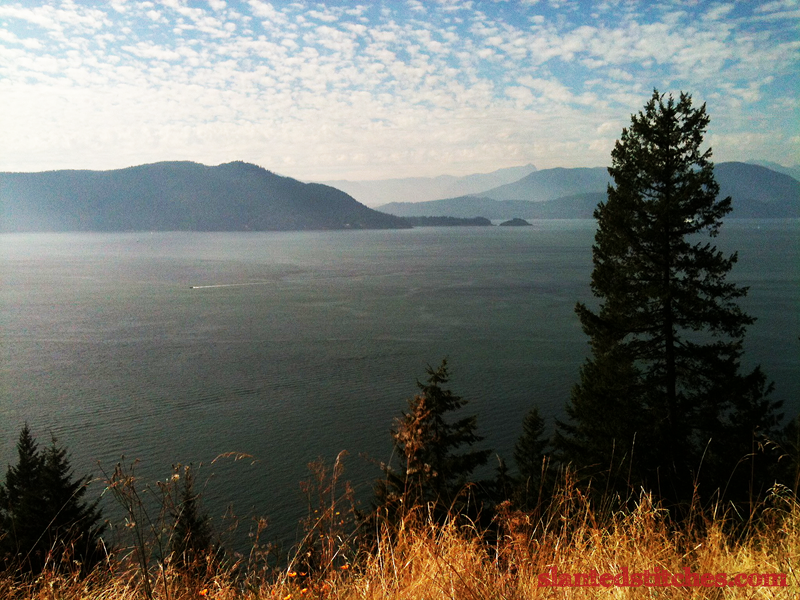 This entry was posted in Road Trip, Zigzagging and tagged Chattanooga, clouds, Florida, landscapes, photography, roadtrip, sunset, Tampa, Tennessee, Texas, Whistler on October 6, 2014 by slantedstitches. Full Circle or Right-Angled Triangle? These two projects have accompanied me on the 10,000 miles I have traveled in the last 5 weeks. I was SO confident that they would easy, mindless road trip projects and be completed on the first trip. Boy, was I wrong. 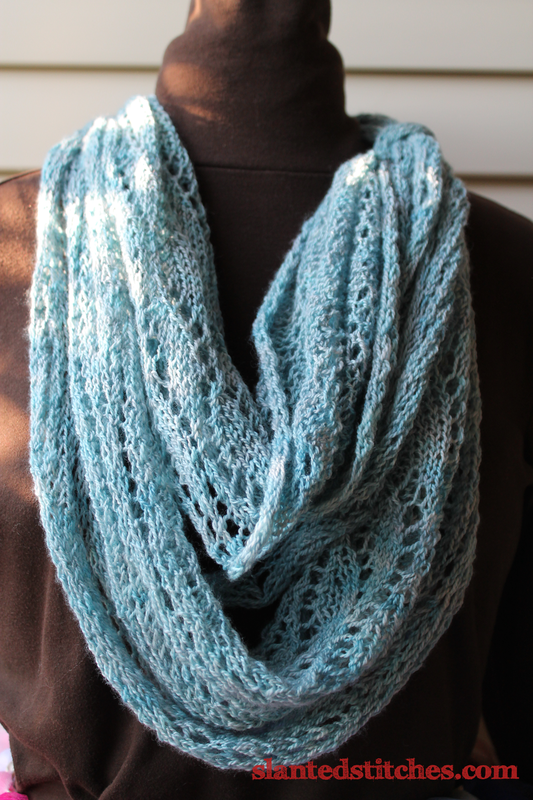 I picked Estuary, the TinCan Knits lace shawl pattern by Emily Wessel for the time I would be spending along the waters of the Pacific Northwest. The Sea to Sky colorway of Huckleberry Knits Cascara lace yarn (from Bellingham, Washington) bought at the Fiber Fusion Northwest in Snohomish last year was the perfect choice. It was the perfect project to symbolize the trip, but definitely not mindless knitting. I could only work on it if I had lots of space, time and no interruptions. So it was relegated to a few minutes at night in the hotel rooms. You can see I mistakenly skipped a few rows in the pattern. Let’s just say, my Estuary had some choppy waters. Instead of finishing on the first trip in the northwestern corner of the US, it was finished on the last trip at the opposite corner of the US. I know, Tampa is not technically at the edge, just 250 miles from the actual edge. 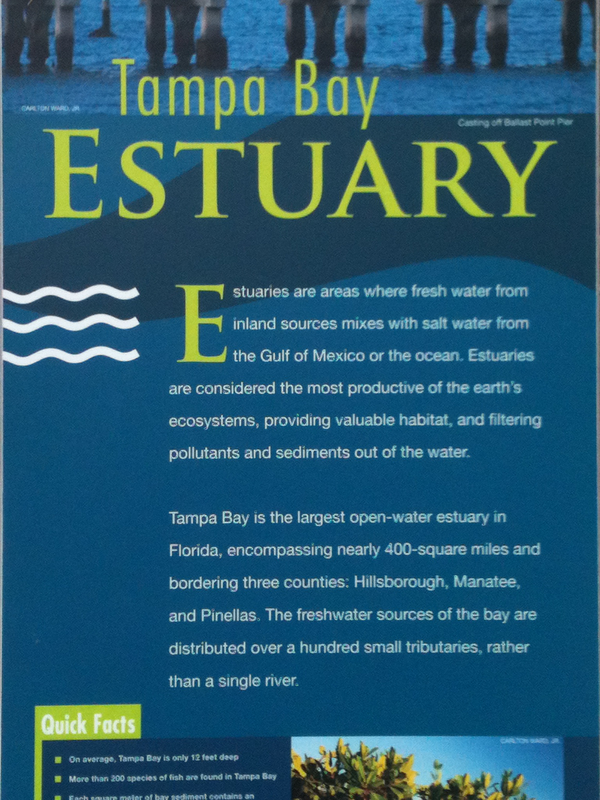 The fun thing, our hotel is looking out to Tampa Bay near a spot called the Estuary. It feels like I’ve come full circle…is it really a right-angled triangle? And the always easy vanilla socks. Not so easy this time. 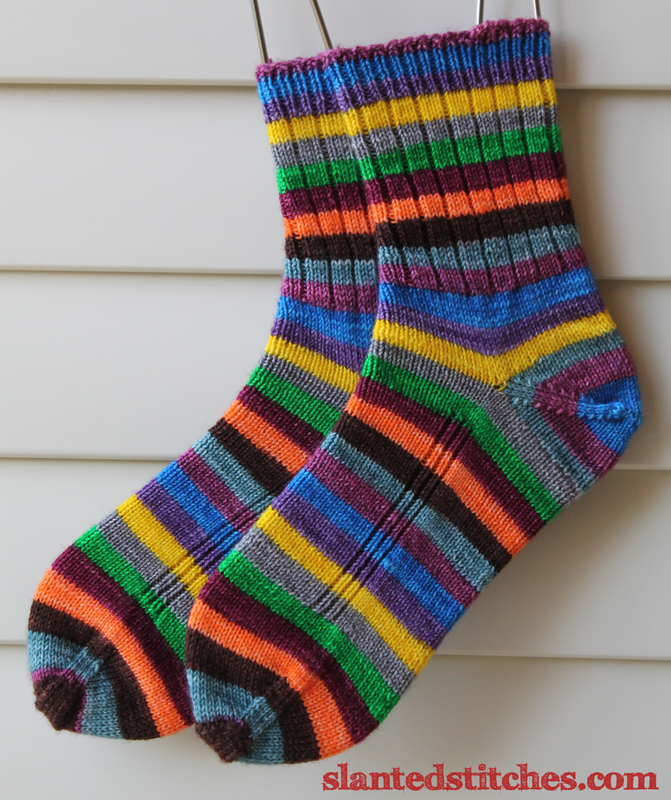 The 10 Days of Fiesta Perfect sock yarn by Must Stash yarns is 10 evenly striped colors. Something new for me and has been come quite a learning experience. I discovered that the afterthought heel looks the best. I have never done an afterthought heel before. Well…I didn’t technically do an after-thought heel. The first heel I did was one I knew and assumed would look ok, the Fish Lips Kiss heel. Nope, it looked terrible. So on the second sock, I decided to do an afterthought heel. It looks SO much better. 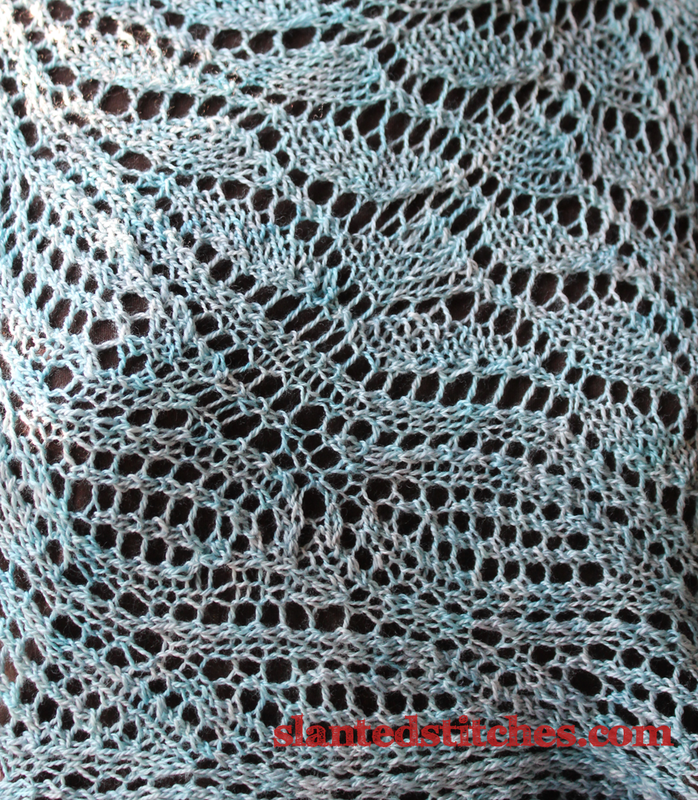 Except for the holes at the two end points and the pointy tips of the Kitchener stitch bind off. Figured out how to fix the holes and points when I ripped out the first sock’s Fish Lips Kiss (FLK) heel and re-knit as an afterthought heel. 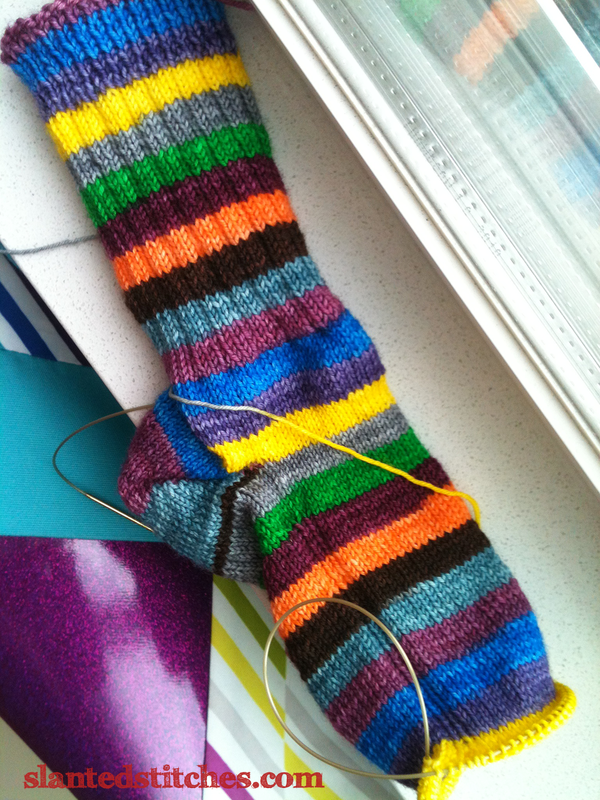 Then the second sock’s heel was re-knit again. Hubby thinks I’m crazy. He doesn’t understand why I’m willing to undo several hours of work, like I was happy being punished as Sisyphus. Not so when I am learning something new. I think I’m going to try the Double Heelix next. The best video I’ve found on the Kitchener stitch is Ann Hanson’s free mini Craftsy class, The Ins & Outs of Grafting. This entry was posted in Knitting, Road Trip and tagged Finished Objects, FOs, knitting, lace, self-striping yarn, shawl, socks on October 3, 2014 by slantedstitches. Did I mention I’ve been traveling a lot? On trip #2, like I said in the previous post, Traveling Still, I’ve been fabric hunting instead of sewing. In Pittsburgh, I was gifted some fabrics by a dear friend. So I brought home another 20 pounds of fabric. And as mentioned in the previous post, I wasn’t able to finish the new set of sock size bag. I manage to finish one prototype bag. I’ve been using it, road testing it for my sock knitting. I love the sparkling vinyl. It’s so fun to see all the time. But I’m glad the rest weren’t complete… there are plenty of modification to make. I need to switch to stronger thread and reinforce seams. I needed to redesign the strap. I needed to change the size just a bit to better fit a pattern. And I need to find a better fabric for the snap band. Check, check, check, check and check! That was all accomplished on the 3 days we were home between trips #2 & #3. I LOVE the new bag! Just a few more tweaks needed. Trip #3 was much better. No sewing machine. Instead, I brought my least favorite aspect of business…my laptop. I have been able to plug everything into the accounting database and linked scanned receipts to entries. Stuff I’ve been putting off since starting this little venture. Finally getting all that accounting backlog up to date makes me feel a tiny bit more professional. Love checking this box off my procrastination list. For brownie points, I managed to write the first drafts of these blog posts. The tote I was using on the first two trips wasn’t big enough, so I switched to a tote bag given to me by my sister-in-law. Love the size of this bag. My medium size and sock size bags fit comfortably along with my purse and a full size notebook. 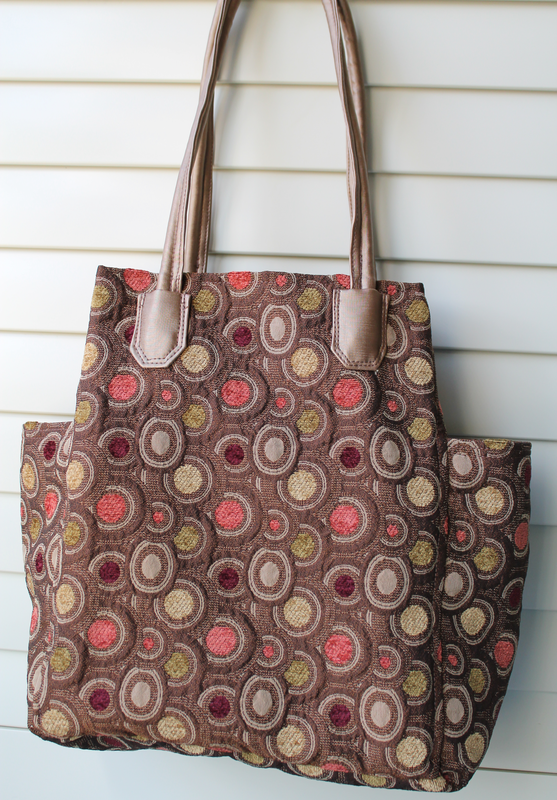 I plan to use this size and another tote bag I bought on trip #1 as pattern samples for my new totes. Trip #3 included a stop at my favorite fabric haunts in Dallas. Just filling in the holes of my stash, things I can’t ever find at the local big box stores. Nothing exciting. I am looking forward to getting back into the sweatshop, to start production on the sock size bags and experimenting with different tote bags. But for now, I have to spend some time getting the Etsy shop back up. Next 2 posts will be more about the trips, Full Circle or Right-Angled Triangle, Road Trip Drive-bys. This entry was posted in Etsy Shop: Slanted Stitches, Road Trip, Sewing, Zigzagging and tagged Dallas, fabrics, Granville Island, knitting, project bags on October 1, 2014 by slantedstitches.